In September 2012, the Criterion Collection released the director approved edition of director David Fincher’s The Game (1997) on BD and DVD. The package features an essay by David Sterritt, Chairman of the National Society of Film Critics. 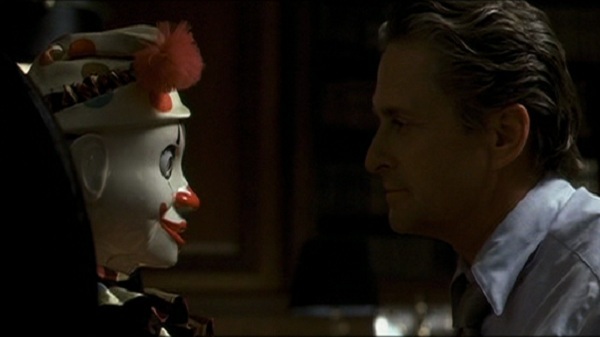 In one of Fincher’s best casting choices ever, Michael Douglas plays Nicholas Van Orton, a bottom-lining investment banker whose wife has left him some time ago and whose brother Conrad (Sean Penn) is his only family. At the beginning of the film, we learn that Nicholas is turning 48, and his father committed suicide by jumping to his death on the same birthday when Nicholas was a child. His younger brother – the black sheep of the family – gives him a gift certificate for Consumer Recreation Services (CRS) and promises the experience of his lifetime. Nicholas would not have bothered, but the next day just happens to find himself in the lobby of the CRS building and decides to take his brother up on the offer. Much to Nicholas’ dismay, his initial visit ultimately includes a day-long battery of psychological profiling and physical testing, after which the executive with CRS presents him with an agreement where Nicholas acknowledges and consents to play along with the “experiential book of the month club” from which he can drop out at any time. CRS seems to be too bureaucratic and disorganized to cause Nicholas concern. But the “game” ends up being quite an unexpected ride. And by the time we get to the last 10 minutes of the film, it seems to Nicholas and to the viewer that CRS really consists of a group of savvy conspirators who – armed with an army of actors and special effects – are financially exploiting the ultra-wealthy/ultra-bored. For some viewers, Nicholas’ just desserts might just resonate more in 2012 than it did in 1997. But then come those last 10 minutes. As the cover of the Criterion Collection DVD shows and the flashback sequences in the prologue anticipate, Nicholas succumbs to despair upon learning that he just shot his brother by accident. He walks to the edge of the building and right off, falling dozens of stories – only to crash through a ceiling of breakaway glass and into an inflated air bag where a birthday party with all his friends, enemies, and CRS employees are awaiting him. As his brother joins him in the ballroom (sporting a fake blood stain on his white jacket), we realize that Fincher’s tale is (as he puts it) a postmodern take on A Christmas Carol with Gordon Gekko as a stand-in for Ebenezer Scrooge. One of the reasons I had not revisited the film in the last 15 years was the memory of being unimpressed with the ending. For me and for many other viewers, it seemed way too convenient that of all the places Nicholas could have picked to jump off the building, CRS had planned so well for – not just a contingency, but an eventuality. For this same reason, I was drawn to the recent Criterion Collection release with the promise of an “alternate ending.” This alternate ending proved to be nothing more than a relatively inconsequential change in the final scene, but on second viewing, I did manage to notice the following image. Not only does Nicholas happen to jump from the top of the building to land in a safe area, but he lands where an X literally marks the spot. At this point in an otherwise (arguably) earnest film, Fincher is clearly winking at the viewer. Not only has Nicholas been played by the game, but so have we. As essayist/critic David Sterritt points out, the film echoes The Wizard of Oz (1939), Vertigo (1958), and The Parallax View (1974) – sometimes both visually and textually. So on reconsideration, I believe Fincher is ultimately playing with audience expectations, as was the case with Se7en and Fight Club, and breaking the deal that the director strikes with viewers to suspend disbelief in exchange for a remotely plausible ending. Indeed, considering the very nature of the omnipresent CRS as a character in the film, The Game may work best as a meta-movie. Even so, the question remains – how effective is the film? Could this controversial ending simply be dismissed as sincere but ill-conceived? And does Fincher lose a portion of the audience by essentially rewarding an attempted suicide? As one of the top grossing films of 1995, Se7en is so well executed that a passing fan could easily miss (or simply not care about) all the ways that it defies the conventions of the cop v. serial killer genre (e.g, turning of the idea of a Dirty Harry prototype as moral hero on its head). In the same vein as hyper-kinetic indies like Trainspotting (1996), Fight Club wore its satirical take on millennial-eve male pathos on its sleeve in both the narration and visual style. But The Game‘s connections to particular genre expectations are looser (IMDB says “Drama-Mystery-Thriller”), and in this respect, the film might just be too smart for it’s own good. Okay, but how is Fincher is playing with audience expectations? Where else did you find examples of this upon a repeat viewing? That X just further pointed out the huge improbability of the climax to me. I love the game, but try as I might I cannot defend this moment and I would love it if I could. The audience expectation Fincher is playing with is that the viewer willing to buy into this genre (mystery thriller) offers a suspension of SOME disbeief (to a point) with the expected payoff for enduring all that anxiety in the form of a convincing (if not entirely plausible) endgame. 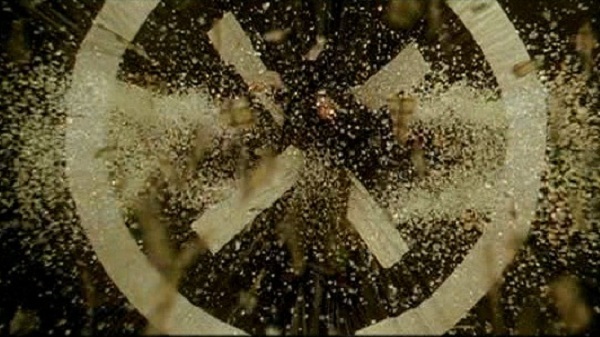 In The Game, not only is Fincher asking the viewer to suspend TOO MUCH in assuming Nicholas would just walk off the building in the right general location, but (as I missed the half-second shot the first time I saw it), Fincher slaps the viewer in the face with the “X” marking the spot. In other words, he says, “Actually NONE of this is worth suspending your disbelief.” We started with Vertigo, but in an openly disingenuous manner, Fincher turnes it into A Christmas Carol. And with the essential element of CRS itself (consisting mostly of actors performing elaborate scenerios), the film becomes a meta-film, and the ostensible genre itself is a game (so to speak). Fincher is calling attention to this precarious balance between viewer and director – based on that suspension of disbelief – and basically mocks it. On a repeated viewing, I found the multiple references to The Wizard of Oz, the Hitchock tropes (right down to the setting), etc. (like a Tarantino film really). And for me, the ending went from being “poorly constructed” on first viewing to being comical this time around. In my estimation, the weakness (and why, despite all the craft and the stellar performances, it is just an B+ film for me) is that all of the meta aspects are shoved too much to the back end (the last 10 minutes). Plus, the “subversive” or “provocative” ending could also be interpreted as insulting. By contrast, Fight Club’s satire is evident in steady doses throughout the film, while at the same time it is hard to deny the “truth” in what Tyler is saying (e.g., the scene at the convenience store). And by contrast, Se7en is filled with enough straight suspense and abrupt turns to be effective as both a genre and anti-genre film. The Game is definitely not the best of those three films.